Women live 6-8 years longer than men. In fact, men in rich countries are twice as likely to die as women at any age. However "there is one place in the world where men live as long as women," reports Dr. Susan Pinker, a psychologist, author and columnist for the Wall Street Journal. It's a remote Italian island, Sardina, between Corsica and Tunisia. In fact, a surprising number of residents live to be 100 - "6 times the centenarians as on the Italian mainland, less than 200 miles away" and "10 times the as many centenarians as there are in North America," she reports. What's their secret? To find out, Dr. Pinker visited the island, and a village called Villagrande. What's remarkable is its density - "tightly spaced houses, interwoven alleys and streets. 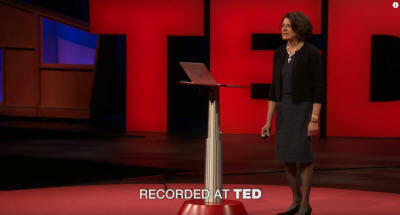 It means the villagers' lives constantly intersect," she said, which viewers of her "TED Talk" could see for themselves. By contrast with the life at Villagrande, in the West, "social isolation is the public health risk of our time," she asserts noting that a third of the population says they have two or fewer people to lean on. She interviewed three centenarians. Giuseppe Munnu, 102, a very gregarious man, whose wife also lived past 100. He was being cared for by two sons, both in their 70s. By contrast, Giovanni Corrias, 101, is "the grumpiest person I have ever met." When asked how he lived so long, he grumbled, "Nobody has to know my secrets." A niece looked after him, saying "Looking after this man is a pleasure. It's a huge privilege for me." When she interviewed them, "I found a kitchen party. They're always surrounded by extended family, by friends, by neighbors, the priest, the barkeeper, the grocer. People are always there or dropping by." She met with Zia Teresa, a woman of 100+, who taught her to make culurgiones - pasta pockets like ravioli which are filled with high-fat ricotta and mint and drenched in tomato sauce. "That's when I discovered a low-fat, Gluten-free diet is not what it takes to live to 100." Pinker's visit prompted her to ask herself some key questions: "When am I going to die and how can I put that day off? The answer is not what we expect." She cited the research of Julianne Holt-Lunstad at Brigham Young University who studied tens of thousands of middle aged people, looking at every aspect of their lifestyle - their diet, exercise and marital status. She waited seven years, and of those still breathing, she looked at her data examining from the least powerful predictor to the strongest. A person with hypertension or who is overweight has nothing to fear. She found having a flu vaccine protects you more than doing exercise! If you quit smoking or drinking is less important than "your close relationships. These are the people that you can call on for a loan if you need money suddenly, who will call the doctor if you're if you're not feeling well or who will take you to the hospital, or who will sit with you if you're having an existential crisis, if you are in despair." She asserted, "Those people, that little clutch or people are a strong predictor, if you have them, of how long you will live." Another key factor came as a surprise - "How much you interact with people as you move through your day? How many people do you talk to? ...not just the people you're really close to, who mean a lot to you, but, like, do you talk to the guy who every day makes your coffee? Do you talk to the postman? Do you talk to the woman who walks by your house ever day with her dog? "Do you play bridge or poker, have a book club? 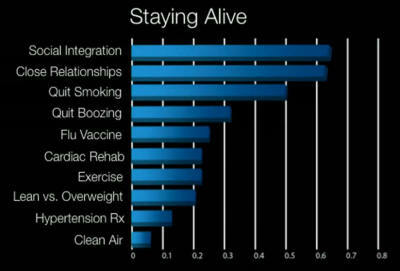 Those interactions are one of the strongest predictors of how long you'll live." Americans now spend more time online than sleeping - 11 hours a day. Is texting one's kids as useful as having face-to-face contact? No. "Face-to-face contact releases a whole cascade of neurotransmitters" which "protect you now and well into the future." Why do women live longer than men? "Women are more likely to prioritize and groom their face-to-face relationships over their lifespan. These friendships create a biological force field against disease and decline." Dr. Pinker concludes: "Building in-person interaction into our cities, into our workplaces into our agendas bolsters the immune system and helps us live longer." Reach out and become more socially connected!